Ijust love winter as it transforms the landscape into something wonderful. 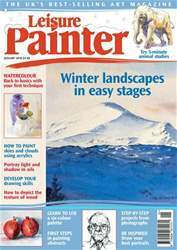 A whole new range of painting subjects arise, which can’t happen any other time of year. Over the next three months I’m going to share my approach to using watercolour to capture the essence of this season. Now, whilst I love painting outdoors, and do so all year around, I appreciate that not everyone wants to stand outside, painting in the cold for hours. Often I will work in the studio from photographs and quick sketches, which I make outdoors. I create all the reference material by the roadside so venturing off into the wilds to paint isn’t a requirement. Not everything about winter is white snow and it’s important to include colour and shadow in your work so what is white will stand out. After a fall of snow last winter, I had a day out with my artist friend, Ken, in the Perthshire countryside. We took photographs, and the painting (above) as well as the following demonstration painting came about as a result. I always work from my own photographs when not painting on the spot. It’s important to my work that I experienced the scene first hand.